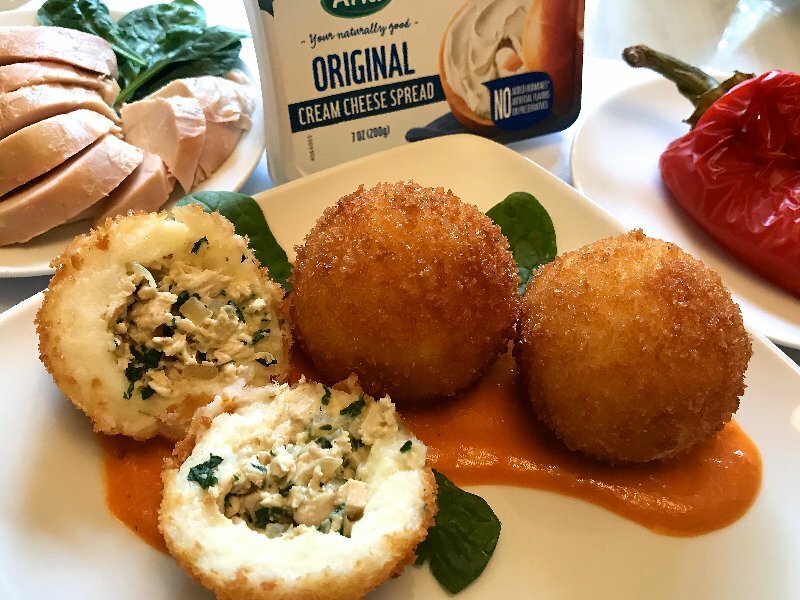 My Chicken & Spinach Potato Balls w/ Creamy Red Pepper Coulis is a unique take on a Brazilian chicken appetizer, AKA coxinha. This exotic bite uses Arla cream cheese three ways: in the potato mixture, in the chicken/spinach filling and in the coulis. How to make it? 2. Heat olive oil in a small sauce pan; add seeded & chopped bell pepper, shallot, and garlic; cook till translucent; add chicken stock and simmer until sauce has reduced to half; season with salt and pepper; add 1 ounces Arla cream cheese and 1 tsp Balsamic vinegar; purée till smooth in food processor; set aside. 3. In a food processor, combine peeled potatoes, 3 ounces Arla cream cheese and salt till smooth; set aside. Sauté onions and garlic in olive oil till translucent; add finely chopped spinach and cook till liquid evaporates; add chicken, 3 ounces Arla cream cheese and parsley; season with salt & black pepper; set aside. 4. Divide potato mixture and chicken filling into 12 equal parts; form balls w/ potato/cream cheese mixture; slightly flatten with hands (using cold water so it won’t stick) and fill with chicken/cream cheese filling; seal with potato mixture; once ball is formed, roll in all-purpose flour, egg wash and Japanese breadcrumbs; heat vegetable oil to 350 degrees F and fry potato balls till golden. 5. Serve w/ creamy red pepper coulis and baby spinach leaves for garnish. Try the same recipe with Arla Herbs & Spices cream cheese spread for a herby touch! Enjoy! Open to legal residents of the 50 United States and D.C., except Maryland and North Dakota and where prohibited, age 21 or older. Void in Maryland, North Dakota and where prohibited. Contest ends at 4:59 p.m. ET on June 1, 2018. For full official rules and to enter, visit www.foodnetwork.com/choppedchallenge. Sponsored by Television Food Network, G.P., 75 Ninth Avenue, New York, NY 10001.